The architecture of the Prince of Wales Hotel in the town of Niagara on the Lake in Ontario, Canada which dates back to 1864, adorns this street corner. The Prince of Wales Hotel explodes with its Victorian elegance and was named after a royal visit in 1901 by the future George V.
Parked on the street, near the colorful, blossoming tulips, a horse and carriage stops outside the hotel to take visitors on a historic tour of the town. Many tourists to Niagara-on-the-Lake find the only way to experience the historic aura of this town is to tour in a horse and carriage with a coachman who can answer any questions one may have. Horse and carriage outside the Prince of Wales Hotel (built in 1864) surrounded by colourful tulip flowers, Tulipa, in the town of Niagara-on-the-Lake, Ontario, Canada. 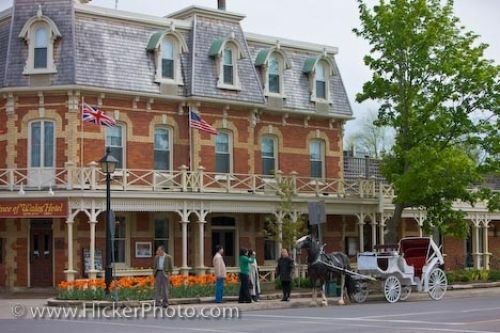 Picture of the historic Prince of Wales Hotel in Niagara-on-the-Lake, Ontario with a horse and carriage tour waiting out front.